Veggie Terrain will be on a short hiatus while JD and CH go on a much-needed vacation. Our trip will take us (on the road) all the way from Chicago to Toronto, Ontario. But don't worry! When we return, I anticipate posting lots of delicious food, wine, and beer pics. 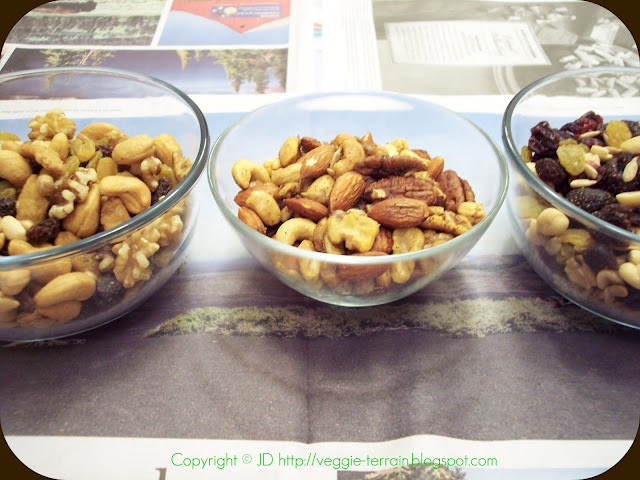 Hopefully this quick trail mix post will tide you over until then! 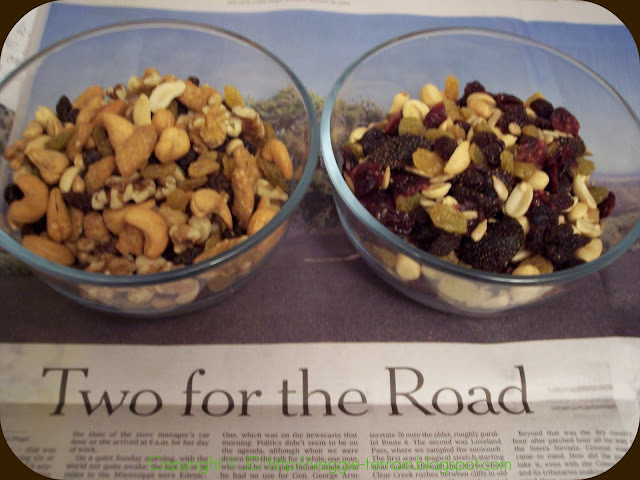 If there's one thing I know for sure, it's that road trips present the perfect opportunity to throw together one of the easiest (and healthiest) snacks you can make: trail mix! Clearly, the ample - and arguably endless - possibilities for flavor and texture combinations make trail mix fun to make. 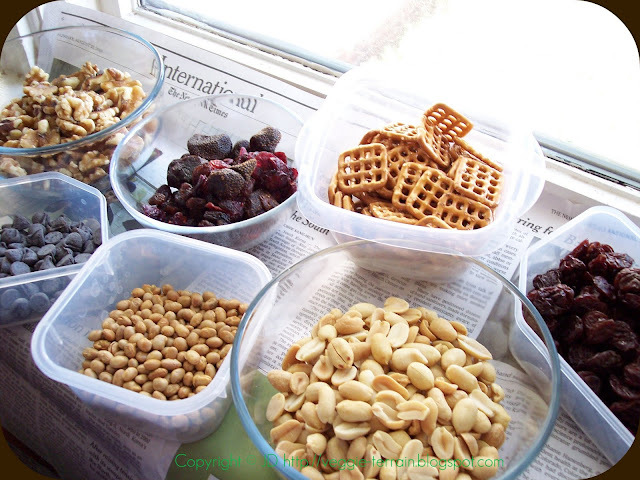 For example, your trail mix could consist of 1 part dried fruits (ie: cranberries; strawberries; cherries; raisins; apricots; or blueberries), plus 1 part nuts/seeds (ie: almonds; peanuts; walnuts; pecans; cashews; or sunflower seeds), plus 1 part "sweets" (ie: vegan chocolate chips/marshmallows; coconut flakes; dates; or crystallized ginger), and 1 part "extras" (ie: pretzels; soy nuts; roasted edamame; sesame sticks; Grape Nuts Cereal; granola; or mini-crackers). Alternatively, leave out one or two parts if you want, or add an entirely new category all together. The Vegetarian Food Fair in Toronto is the weekend of Sept 11-13. If you're in town then, check it out! Yum I love trail mix. Enjoy your trip! OMG have FUN on your vacation!!!! 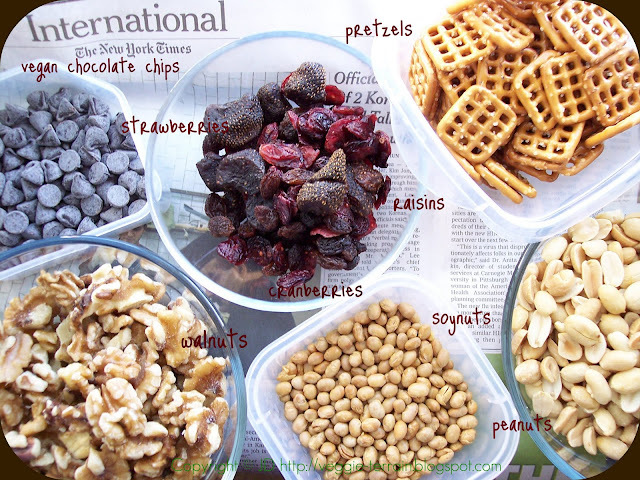 What an awesome looking trail mix! Trail mix, always a good thing. How fabulous!! That is such great road food. This is so simple but awesome. For some reason I never thought to add pretzels to trail mix. And I agree that you need a good ratio of salty/sweet, soft/hard, etc. Now I want to go make some trail mix! All the ingredients in it look great-- and good idea to make this with raisins! You don't by any chance know a good place to find vegan chocolate, do you? @Tina- I normally get my Trail Mix from NutsOnline-- I've looked a fair bit and they seem to consistently have the best prices. Hi Tina - thanks for the compliment, and I apologize for the gap in my response time! I typically buy vegan chocolate chips at Whole Foods or Trader Joe's. If you don't have one of those nearby, you can also purchase them online at veganessentials.com or amazon.com. Feel free to try your local health food stores, too - they're a great resource!